All it takes is a sneeze on the set of Chilling Adventures of Sabrina and the cast and crew will respond with a hearty "Hail, Satan!" 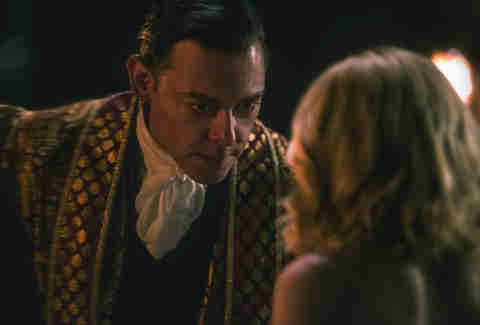 As I soon learn, this practice began when Richard Coyle, who plays Father Blackwood, the High Priest of the Church of Night, gave a sermon during episode 3. In an unscripted flourish that didn't survive the final cut, Coyle decided to end the sermon with a low-key "Hail, Satan." The first time Coyle said it, there were some giggles. But then it got picked up for sneezing use, happily adopted to replace "Gesundheit" and "Bless you." With around 300 crew members chiming in on the Vancouver set, "it turns into this massive echo," says production designer Lisa Soper. "You can hear it everywhere." "We even made crew T-shirts saying 'Hail, Satan!'" Coyle adds. "We're all in on the joke." But sneezing rituals were far from the only inside info we learned from a visit to the Netflix show's Vancouver set, where the cast and crew were shooting one of the streaming giant's most-anticipated shows of its massive fall original series slate. Here's what we learned about the show -- which is decidedly darker and witchier than the popular '90s sitcom adaptation starring Melissa Joan Hart -- and the goings-on behind the scenes. There's at least one Riverdale Easter egg. Chilling Adventures of Sabrina might seem like a Riverdale spinoff -- same showrunner, same characters from the Archie Comics -- but you’d be hard-pressed to find any solid connections between the two shows. That is, unless you climb to the top of a certain bookcase in the Baxter High library, where you’ll find the little crown that Jughead carved into the wood, along with the words "was here." Father Blackwood's evil character was partly inspired by Hitler. Father Blackwood is the "ultimate sociopath," Blackwood actor Richard Coyle says. "This is a character who would have the hubris to tell the Dark Lord that he’s thinking too small. He thinks, 'I hate my boss, but I've got to do what I’m told.'" Coyle took inspiration from the British comedy Yes, Minister (and its sequel, Yes, Prime Minister), because the setup is that the prime minster is an idiot and just a figurehead, whereas his minions have all the brains. Father Blackwood, then, would be the one with the brains. "I think there’s something really interesting in that idea," Coyle says. The actor also took inspiration from a book written by Adolf Hitler’s secretary, Gertraud Junge. "To his inner circle, [Hitler] could be very charming," Coyle says, "so long as everything was the way he liked it. As soon as something wasn't, he would just blow up." For Father Blackwood, Sabrina is the girl making sure everything is not the way he likes it. "He has a history with her parents," Coyle says. "And because her parents are of mixed heritage, Sabrina poses a threat. It's tricky, because he's in charge of her pastoral care, on behalf of the Dark Lord, so he’s in a difficult position in that he has to provide her with an education while harboring some very strong feelings about her history, her parents, and some other things that he knows about." Not everyone loves the "Hail, Satan" gag. "I do not participate in [saying 'Hail, Satan]," says Tati Gabrielle, who plays the witch Prudence. Tati was brought up Baptist, and says she felt "very uncomfortable" with this sudden Satan thing. So she came up with an alternative: "I say, 'Curse you!' as opposed to 'bless you!'" She's also uneasy about other occultist aspects of the show. Like the real spells (in Latin and German) that crop up in the scripts and are carved into the wood on the set for Sabrina Spellman's home. And the Satanic symbols in Blackwood's office. "When we did this one ritual sacrifice," Gabrielle recalls, "I was like, 'All right, guys, this is really not OK!' We were calling on some really dark forces, so I was like, 'What are we playing with here, and how can we stop it from infecting our own personal spirits?'" Now the actress recites an "Our Father" prayer before launching into the Latin spells for her wicked scenes, and she keeps crystals and sage at home for protection (although she's aware that neither of those are part of the Baptist tradition). "It's just to keep my energy clear," Gabrielle says. "Like, when we step off the set, let's leave all the Satanic stuff behind." Sabrina's father, Edward, plays a big role off the screen. Throughout the series, Sabrina hears from various people about the exploits of her father Edward Spellman, the former High Priest of the Church of Night. Some of these stories will come from a fellow student, Nicholas Scratch (Gavin Leatherwood), who has a particular interest in Edward Spellman studies. "We all have idols; we all revere certain people," Leatherwood says. "For me, I'm an Alan Watts fan. He’s a British philosopher, and he recorded a lot of great lectures over the years. I'm obsessed with Alan Watts in the way Nicholas is obsessed with her father. Both men are sort of legendary. They made a strong impact on their communities." Exactly what Edward Spellman's impact was -- and why his successor, Father Blackwood, is not a fan -- remains a mystery for viewers to discover on their own. Not everyone in the Spellman family is a devout Satan worshipper. Aunt Hilda is like the Ron Weasley of the witching world, actress Lucy Davis says. Hilda is more interested in the mortal world than her fellow non-mortals think she should be, and while she respects the Church of Night, she mostly just limply acquiesces to its teachings. "It's a bit like if you’ve been brought up in any family that's devout," Davis says. "You go, 'Sure, yeah, we'll go to church on Sunday.' You just go along." Still, Hilda is one of Sabrina's biggest supporters, though her efforts often go unrecognized. In one episode, she violates witch law to help Sabrina with some particularly difficult magic. But when Aunt Zelda swoops in to assist at the end of the ritual, Sabrina's thanks go to her, not Hilda. "Miranda Otto's and my favorite scenes are when Zelda and Hilda are at odds," Davis says. "It can be something really small, and they react to it differently, and their reactions are funnier because of that." The shows is heavily influenced by classic horror films and real-life iconography. "My favorite horror movies," Chilling Adventures creator Roberto Aguirre-Sacasa says, "are stories like The Exorcist and Rosemary's Baby, where the villain is the Devil -- the good old-fashioned Biblical Devil." When students enter the Academy of the Unseen Arts, they pass through what appears to be an abandoned train station marked Gehenna and enter into an infinite series of rooms shaped like pentagrams. (Many of Soper's sets feature forms of sacred geometry as well as optical illusions). The foyer features a large carved figure of the Sabbatic goat Baphomet. "There are a whole bunch of these guys all over North America and Europe," Soper points out. "What's really fun about our using this stuff is that when people watch the show, they can go, 'Wait a second, does that actually exist?'" And it does. The actor who plays Harvey Kinkle wants to do a cannibalism scene. "I will summarize it in one word: sticky." When we asked Chance Perdomo (who plays Sabrina's cousin Ambrose) about whether the people who work in the mortuary sometimes snack on the bodies there for embalming and burial (as they do in the Chilling Adventures of Sabrina comics), he would only say that the innards are made with corn syrup and gelatin and that they are "sticky and chewy." When he saw what the stuff looked like onscreen, he says, "It was kind of horrifying. But that was the point -- it gave me goosebumps." Actor Ross Lynch, who plays Sabrina's mortal boyfriend Harvey Kinkle, hopes that he'll get to eat his own parents -- a real plot point in the Chilling Adventures comics. "Obviously, this is separate from the comics. It's a completely new world, but I kind of hope that happens," Lynch says. "I hope he gets to do something really messed up." We expect nothing but tragically weird things for the Kinkle family. There's a budding Team Harvey vs. Team Nick shipping battle. Even the "mortals" on the show have supernatural experiences. Even the mortal characters will experience the supernatural in their personal lives. Sabrina's BFF Rosalind Walker is "a little bit between the mortal and the witch world," Jaz Sinclair, who plays Roz, says. "I'm not a witch, but I'm not all the way mortal, either." 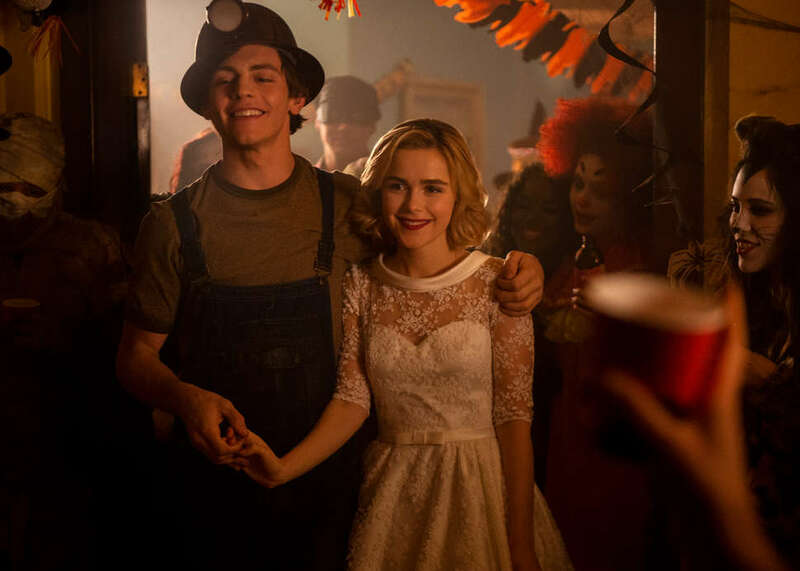 As for Sabrina's other bestie Susie Putnam, "she deals with some pretty weird stuff at home that has nothing to do with Sabrina," actor Lachlan Watson says. Small wonder -- her family, too, has been living in Greendale for generations. Many of the actors have had real-life encounters with non-human worlds. Some members of the cast went to see a psychic medium during the shoot, and according to Davis, the medium told one of the actors, "Something's happening to you, and you need healing from Hilda." What a specific name to pull out of the hat, Davis marveled -- it was her character's name. Davis wasn't really all that surprised, though, since she says she's experienced the supernatural in her own life many times. "There are things that I see that are not explained," she says. "That's the best way of putting it. I've had it all my life. In some periods, it's been stronger than in others." Sometimes, she says -- usually at night -- she can see people who aren't really there. "There are times when it makes you feel mad," she says. Davis claims this has made her sensitive to different energies, and has led her to try an alternative therapy called reconnective healing, which she has offered to hundreds of different clients. "I didn’t know what I was doing at first, frankly," she says. "But it's safe and we have fabulous experiences together. I think we're all in different stages of realization of how close we are to a spiritual world." Meanwhile, Leatherwood claims to have seen a UFO. "I swear a saw a bright pink light out in the middle of nowhere," he says. "It flashed, got brighter, and then zipped on out of there. I'm probably going to get abducted just for telling you about it." Jennifer Vineyard, a regular Thrillist contributor, has written for Elle magazine, The Los Angeles Times, and The New York Times, among many other publications.